I started playing yo-yo when I was 8 years old. I visited the National Y-Yo Museum in Chico, California one day and saw people playing. From that point I knew it was something I wanted to do. The first yo-yo I practiced with was a purple YoYoFactory FAST 201. He is an extremely innovative and stylistic player. I respect that he has accomplished so much in the 1A, 2A and AP divisions. His tricks have a different focus than most players, and he is a brilliant mind when it comes to freestyle construction. John helped me tremendously with my freestyle from last year, and has also helped me this year in coming up with ideas for the freestyle that I never would have imagined. I think SHAQLER (Ando and the rest of his team) put on the best performance yo-yoing has ever seen in the 2010 Worlds AP division. I am so excited to see what Ando and SHAQLER bring to the stage this year. Rei should be included in everyone’s favorite players list. Last year I spent a month in Japan and was lucky to have multiple opportunities to practice with Rei. This was the first time I saw his yo-yoing up close in person. Of course I had seen him on videos and on stage at Worlds in the past, but watching him yo-yo up close in person was truly magical. I have never seen a player with so much cleanliness and overall control of the yo-yo. With these attributes, along with his talent in performing, he is a pleasure to watch every time he gets on stage. If you have ever watched one of Shu Takada’s freestyles, then you know why he is one of my favorite players. 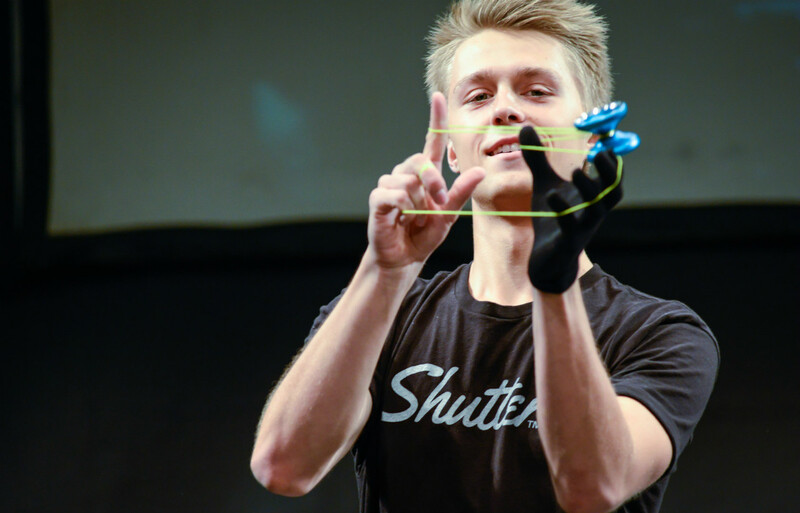 In my opinion, Shu brings more innovation to the stage than any other yo-yo player. Where Shu gains so much of my respect isn’t just in his trick innovation, but more so his performance innovation. I spent a few days hanging out with Shu in Japan last year, and whenever we spoke of yo-yo, we spoke of performance in freestyle; not tricks. You know how you can watch a movie for the second or third time, and notice something new each time? This also happens with Shu’s freestyles. Go watch one now and you will see what I mean. Q4. What made you choose 1A as your main style? In my first competition, I competed in the 1A division. From that point, It has been a constant journey of improvement. I am always striving to improve in 1A, and I believe there is not room to spend time with another division right now If I want to continue to reach my current goals. I usually practice randomly throughout my day, by myself or with US National 4A champion Zac Rubino. The practice consists of making new tricks and yo-yoing to new music. This definitely changes when preparing for a contest. Firstly, I will set aside much more time to practice. Also, when preparing for a contest I do not try to create any new tricks. Instead, I practice only the tricks I am planning to do on stage. I run through my routine with music, stopping only if I have a new idea to improve the routine. Q7. What is the best part of yo-yoing, in your opinion? In my opinion, the best part of yo-yoing is its mixture of creativity and competition. I love both of these things, and I think when they are mixed, I thrive. In 2013, I didn’t pass to finals at the World Yo-Yo Contest. I was extremely upset with this situation, but I eventually came to the conclusion that it needed to happen. Not passing to finals in 2013 shined a light on my ignorance. It allowed me to realize what was wrong with my yo-yoing and my mindset. It allowed me to reflect on what I do, and was the first step in a better understanding. I believe that this experience allowed me to become World Champion. It felt unreal. I had to watch a video of the results in order to feel like it truly happened. The whole day just felt right, even before I stepped on stage. I have gotten a lot more opportunities to travel. Since becoming World Champion, I have performed in China, Hong Kong, Malaysia, Singapore, Vietnam, Japan, and Spain. I did work very hard to earn these opportunities, but I know I am also very lucky to have received them. I feel very confident with my freestyle. I am bringing something to the table at a level nobody has seen before. I am looking forward to the event as a whole, along with all of the amazing freestyles I know will be performed. Many thanks to Gentry Stein! We wish him the best of luck at WYYC2015. I started yo-yoing in the summer of 2009. I started yo-yoing with my dad’s Yomega Brain (he has had it forever) just on the way to school every day. Then in the summer, my dad got really sick so whenever I would visit him in the hospital I would try to learn a new trick beforehand so I could show him. I started watching yo-yo tutorials on YouTube and then went to my first contest. Here are just some of the people who have either helped me with yo-yoing or are some of my favorite players: Grant Johnson, Joseph Harris, Eric Koloski, Ben Conde, Hiroyuki Suzuki, Christopher Chia, Tal Mordoch. 1A is usually the style people start out with, so I was hooked on it pretty quickly. I really love coming up with long tricks and it doesn’t get old. I usually practice in my backyard either with headphones in or I bring a speaker out. I always yo-yo to music, even when I’m just practicing tricks. If I get the chance, I’ll practice with other yo-yoers, like if I can make it to a club near me or right before a contest when everyone’s hanging out. I usually practice at least an hour a day, but if a contest is coming up then I’ll be practicing for a few hours. For a contest like Worlds, I try to start practicing months in advance. Everything about yo-yoing is awesome, but the best part about it in my opinion is the community and all the people. Also all of the opportunities I’ve gotten through yo-yoing, like traveling, performing at events, and teaching people. But the thing I look forward to most when preparing for a contest/yo-yo related event is meeting a bunch of awesome new people and hanging out with friends I’ve gotten close to because of yo-yos. Q8. Do you have any good stories from before you won last year that you want to share with us? There was some weird stuff that happened in Prague before I performed but I won’t talk about that. Q9. How did you feel when you won last year? I was pretty excited, I was happy with my routine and happy that I hit it clean for the most part. I had such a good time meeting/competing with all the girls. Q10. Is there anything that changed for you after becoming winning? Ever since I won, it has only made me practice harder and stay more focused. Also I was surprised to see how much media attention I got locally. That was pretty cool. I’m so excited to compete again, it was so much fun last year. I always look forward to seeing everyone and watching all the finalists. I’ve been practicing a lot, and I can’t wait to visit Tokyo. Many thanks to Tessa Piccillo! We wish her the best of luck at WYYC2015. I became interested when I saw my friend [playing yo-yo]. Koji Yokoyama. If it weren’t for him I wouldn’t be who I am today. Q4. What made you choose 2A as your main style? My extended time practicing for the *THP-Japan Level…maybe. I practice the tricks I think I want to do at the next contest. On weekdays I do nothing but practice each trick in my routine’s order at home. On days off I rent a room and do nothing but repeated, full run-throughs of my freestyle with music. I guess I have been practicing more than ever. I’ll try to do [my freestyle] relaxed. *Translator’s note: The Japan Level was the Hyper Yo-Yo (1997) authorized “THP-Japan Pro Spinner Level.” In that level there were many 2A tricks. Many thanks to Takuma Yamamoto! We wish him the best of luck at WYYC2015. Many thanks to TOMMY and SOUL of SPINATION! We wish them the best of luck at WYYC2015. Many thanks to Takeshi Matsuura! We wish him the best of luck at WYYC2015. Many thanks to Rei Iwakura! We wish him the best of luck at WYYC2015. This year, we had 17 entries from all over the world in Artistic Performance (AP) Division. Thank you for all of your submissions and hard work. We have updated the AP page about feedback to the contestants who did not make it to the final round. [SURPRISE ANNOUNCEMENT] 44CLASH Battle Event is coming to WYYC! Hi, everyone! This is Ue-san from the World Yo-Yo Contest 2015 Organizing Team. 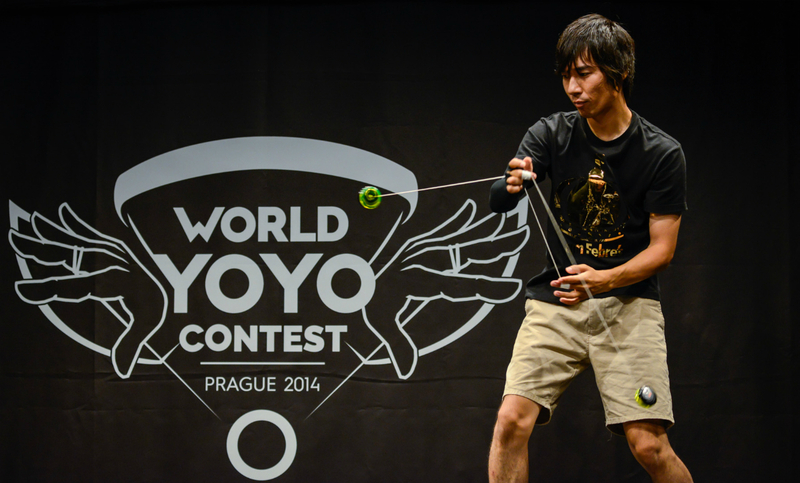 We will have a 44CLASH Battle Event at the Event Stage (1st floor) of the World Yo-Yo Contest 2015. We will announce more details soon. 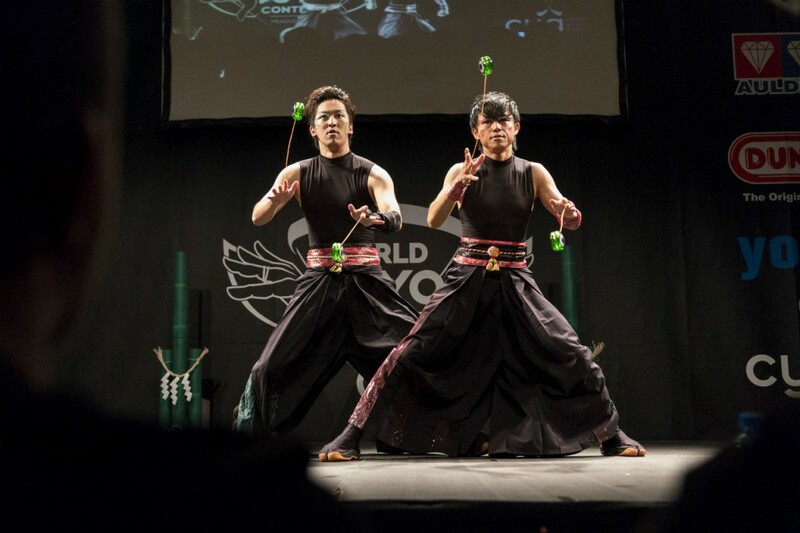 We are also going to have “44FESTA presents WYYC2015 Official Booth” to entertain non yo-yo visitors. We hope you enjoy our 1st floor event. See you in Tokyo! When I was in 2nd Grade (Elementary School). I met Takahiro Mimura (“Miimun”) at a Hyper Yo-Yo event. Hank Freeman – because he is a 3-time consecutive World Champion in 3A and he has new tricks in his freestyle at every contest. Hiroyuki Suzuki – because of his speedy tricks and his sharp freestyles. Sora Ishikawa – because he does unique tricks that no one else is doing, and he advances smoothly from trick to trick. Q4. What made you choose 3A as your main style? I watched Ken Takabayashi and Kentaro Kimura’s freestyle videos and thought they were cool. I work on creating new tricks to get ready for my next contest or practice meeting’s freestyle. I repeatedly practice my routine. Last year I didn’t go to juku* so I had a lot of time to practice. I was very happy. I was excited to stand on the Worlds stage that I had been dreaming about. Q10. 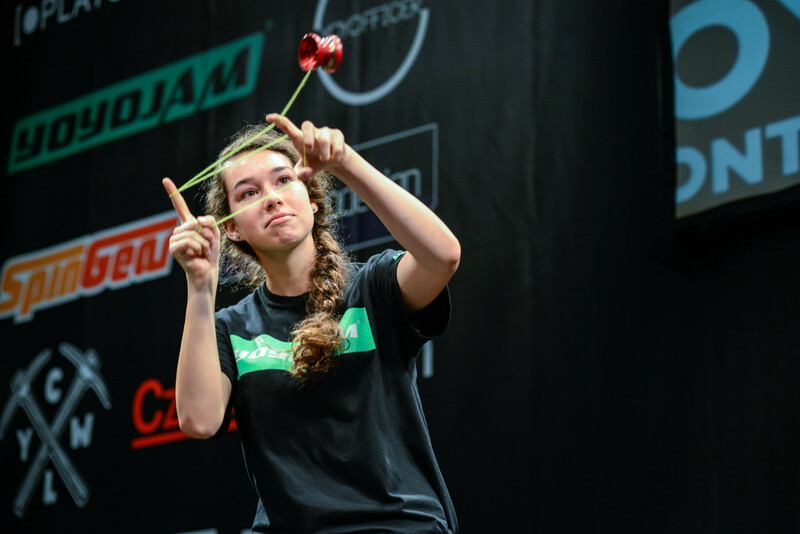 Last year, in addition to winning the World Yo-Yo Contest, you also won such big contests as Japan Nationals and the Asia Pacific Yo-Yo Championships, and you were the youngest player ever to do it. Do you have a new goal or dream you are aiming for? (If I can travel abroad) I hope to achieve a grand slam* once more. I didn’t place well at 2015 Japan Nationals so I’m determined to do better at Worlds. It’s just a small thing that’s always spinning, but it has the power to connect the world. Many thanks to Hajime and his mother! We wish him the best of luck at WYYC2015.